Whatever wild and wonderful adventure Mr Benn has been on, there’s always one reassuring constant! Whether our bowler hat-wearing hero is keeping a king and queen happy, saving cavemen from dinosaurs or finding a genie in a bottle, the Shopkeeper is always on hand to show Mr Benn the doorway back to the normal world. Nowadays, whenever Mr Benn steps inside the costume shop, the Shopkeeper makes sure he doesn’t leave on his adventure without insurance from The Insurance Emporium. So who is this mysterious chap in the bright pink fez? Find out more in our magical infographic below! 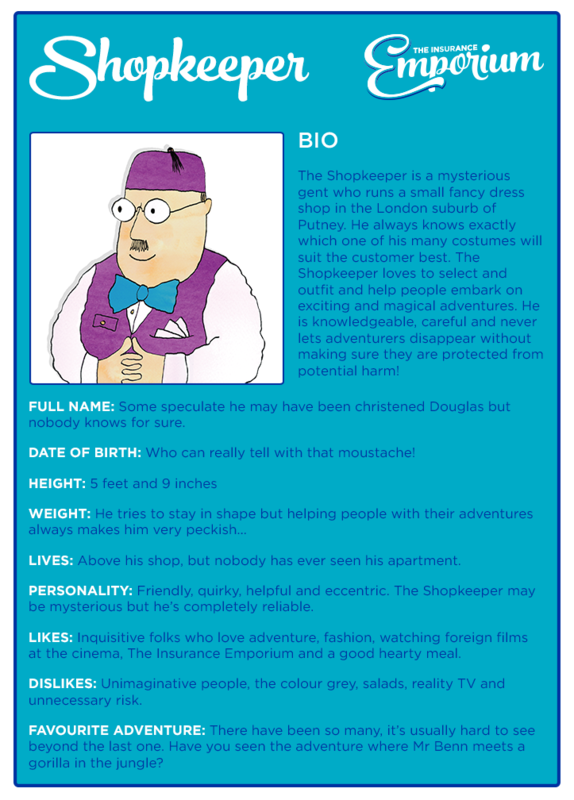 Bio: The Shopkeeper is a mysterious gent who runs a small fancy dress shop in the London suburb of Putney. Nobody knows when it opened, but it’s been there for over 40 years at least! For such a tiny store, the Shopkeeper manages to cram an awful lot of costumes in it and he always knows exactly which one will suit the customer best. There is nothing he loves better than selecting an outfit and watching someone disappear on an exciting and magical adventure. He is knowledgeable and careful and never lets prospective adventurers disappear without making sure they are protected from potential harm! Date of Birth: The Shopkeeper is kind of ageless, who can really tell with that moustache! Height: 5 feet and 9 inches but he tells people he’s just under 6 foot. Lives: Above his shop, but nobody has ever seen his apartment. There’s rumours that he owns a giant porcelain Dalmatian! Personality: Friendly, quirky, helpful and eccentric. The Shopkeeper may be mysterious but he’s completely reliable and always there when you need him, as if by magic! Likes: His favourite customers are inquisitive people who love adventure. The Shopkeeper is also a big fan of fashion, watching foreign films at the cinema, The Insurance Emporium and a good, hearty meal. Dislikes: Unimaginative people, the colour grey (he’s more of a turquoise, pink and red kind of guy), salads, reality TV and unnecessary risk. Favourite Adventure: The next one. Where to now? What’s the delay? Apparently there’s been a bit of a kerfuffle in the jungle! Come on everyone, let’s get going!